If you don’t want to remember another password for your Anisya account, you can simply register on Anisya with your existing Facebook account! NOTE: for those who have previously created an Anisya account, you can automatically link your Facebook account with your existing Anisya profile if you used the same email address on both accounts. 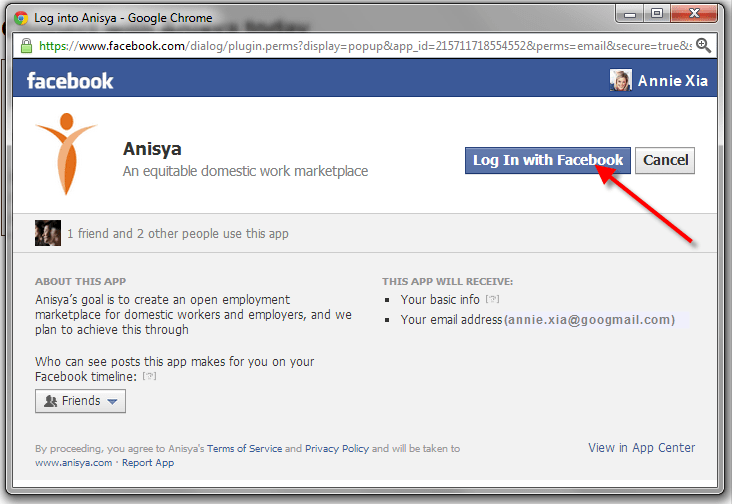 Simply click on “Login with Facebook” on the home page and Anisya takes care of the rest for you. If you use different email addresses on Anisya and Facebook accounts and want to link them, just send us a message through our Facebook page or through the “Contact Us” link on the Anisya website. and then click on the “Login with Facebook”. Enter your Facebook login details then submit. Step 2: Your name and email address are automatically pulled in from Facebook. Fill in the basic registration information: 1. your mobile number (if you want to receive SMS updates, 2. whether you’re creating an account as Employer or Domestic Worker and 3. how you want to receive notifications from Anisya. And then you’re done! You’ll be automatically logged into Anisya as well. Looks easy enough? Get started with your Anisya account today! After you are connected with Anisya, you will need to fill up your profile to start advertising your post. Follow these instructions to fill up your profile.